Pasch and his wife parked the black Corvette next to a friend's 1966 blue Corvette on the west side parking lot of the Comfort Suites, 2750 Fortune W. Circle and retired to their room for the evening. When they woke that morning, the car was gone. Local police checked the video surveillance system at the hotel, but unfortunately, there were no cameras installed in that vicinity of the parking lot where the '65 Corvette was parked. Poor video footage from a neighboring business was able to capture a flatbed trailer leaving the parking lot at about 4:15 a.m. The truck returned about 25 minutes later and was seen leaving again - empty. A few minutes after the truck left, the grainy video footage shows three cars driving out of the lot. 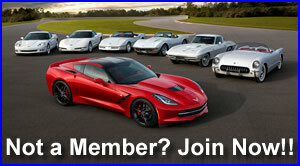 Pasch believes his Corvette was one of them. Curious as to what the thieves would plan to do with this car. Being rare, doubt they could sell it outright, alarms would be going off for any buyer. I would think all the numbers are documented and I have no idea if someone is able to doctor the numbers. Doesn't sound like it was taken for a joy ride. Always curious when a vintage car is stolen, always get the initial article on the theft but hardly ever get a follow-up story. 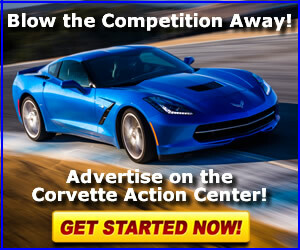 Corvette Central rides along in the RideTech C7 @ Bloomington Gold Autocross!